WORCESTER – For the past two decades, the 1983 movie “A Christmas Story” has been shown in a 24-hour loop on television beginning Christmas Eve and running through Christmas Day. A movie that flopped at the box office when it was first released became an iconic holiday event, and spawned a stage adaptation and, in 2009, a musical that garnered several Tony nominations. The good news is that the national touring production of “A Christmas Story, The Musical” now at the Hanover Theatre for the Performing Arts through Sunday is a joyous re-telling of the tale, incorporating all of the film’s funniest moments, and features a strong score by Benji Pasek and Justin Paul (“Dear Evan Hansen”) and some dazzling dancing – especially by the corps of ultra-talented youngsters. details the 1940 quest by Ralphie Parker to have Santa deliver a “Red Ryder Carbine Action BB Gun” under the tree on Christmas. Remember the fantasy sequences when Ralphie imagines coming to the rescue (“Ralphie to the Rescue”) or dreams about Miss Shields swooning over his essay? Ralphie’s indiscreet use of the “F word” and subsequent dinner of Lux soap? The flagpole incident? Ralphie’s beatdown of the bully Scut Farkus? Ralphie’s bunny pajamas? It’s all here. As narrator Jean Shepard, whose recollections of his boyhood in Indiana formed the basis for the film, Chris Carsten projects the necessary warmth as he wanders in and out of the scenes, breaking down the fourth wall to let us know what Ralphie was really thinking. Carsten is a warm, welcoming presence as Shepherd, his wry humor and commentary providing the perfect accompaniment to the merriment onstage. Tristan Klaphake, one of two Ralphies alternating in the part, is fine as the brainstorming, scheming young boy seemingly stifled at every turn in his quest to get the best Christmas gift ever, and Evan Christy does just as well as Ralphie’s tormented younger brother Randy, he of the snowsuit so suffocating it’s impossible to move. Even the Bumpus Hounds are here in all their glory, terrifying the blustering Old Man (Paul Nobrega) as he curses at the furnace and plots to win the jackpot of a newspaper contest. Sara Zoe Budnik is the warm-hearted mother doing her best to get her family through the frigid Indiana winter and safely across the Christmas finish line, and Paul and Pasek deliver her a heartfelt “What a Mother Does.”. There is some sparkling tap dancing by young Wyatt Oswald in the speakeasy fantasy scene “You’ll Shoot Your Eye Out” that features the normally demure Miss Shields (Angelic Richie), Ralphie’s teacher, as a wanton showgirl letting it all hang out. “A Christmas Story” is going nowhere without a corps of talented youngsters, and they are truly remarkable and beyond cute. This show features first-rate production values you don’t always see in touring productions, including lovely scenic design by Walt Spangler, adapted by Michael Carnahan, that captures both the warmth of the Parker home on Cleveland Street, Santa’s home at Higbee’s Department Store, and points in between. But can Ralphie overcome the the skepticism and doubts of all the adults in his life — including Santa — to find that Red Ryder BB gun under the tree? “A Christmas Story, The Musical” will put a smile on your face, leave you with a lump in your throat and send you out of the theater feeling warm-hearted and happy this holiday season. 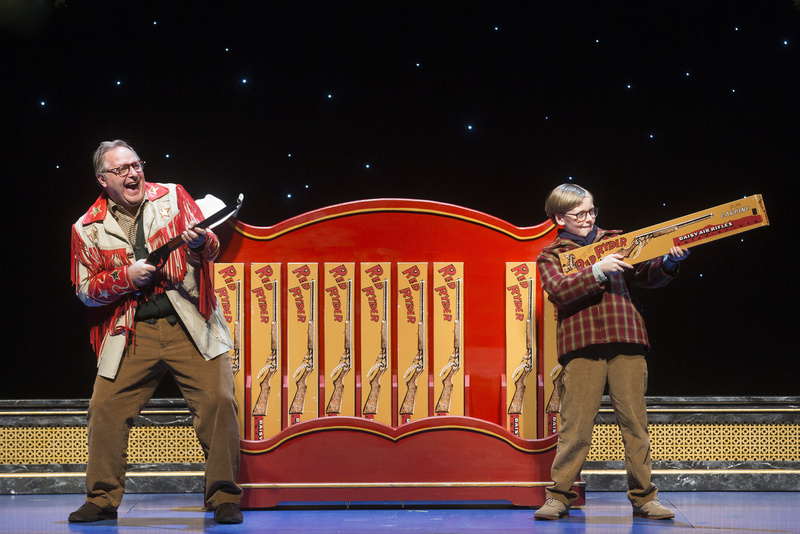 The national touring production of “A Christmas Story, The Musical.” Music and lyrics by Benji Pasek and Justin Paul. Book by Joseph Robinette, based on the motion picture “A Christmas Story” and the book “In God We Trust, All Others Must Pay Cash” by Jean Shepherd. Directed by Matt Lenz. Choreographed by Warren Carlyle. At The Hanover Theatre through Nov. 12, thehanovertheatre.org.